← Valentino Shoes & Cobblestones- Haute Couture or a Hot Mess? There are many perks of living in the fashion capital known as Paris, and twice a year the most exciting event rolls around… Fashion Week! The streets of Paris fill up with fashionable men and women from all over the world, and the inspiration is never-ending. On Wednesday afternoon I finally had an opening in my schedule to check out the atmosphere outside a haute couture fashion show, so I hopped on the metro to Palais de Tokyo for the Viktor & Rolf couture show. What met me at the entrance to the show did not disappoint, heaps of street style photographers and a handful of fashion journalists were perched together trying to be the first one to notice the new faces arriving. 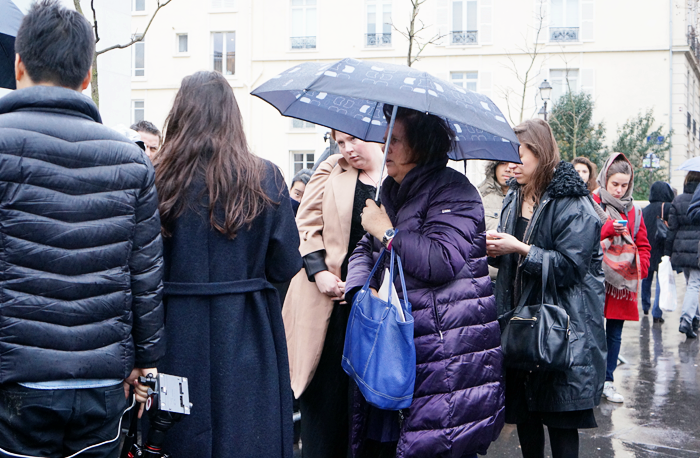 After a while being mesmerized by all of the fashionable people outside and entering the Viktor & Rolf show, I finally remembered my own camera and happily joined the masses to shoot some pictures myself. Seeing how journalists and photographers worked outside the show, shouting the names of the guests and asking them about their outfit – I became even more intrigued by the business of fashion and to learn how it all worked from the inside.It was very interesting to watch the way the journalists had to hurry to write down all the information about the person; what their name was and who they were wearing, to create what in the end would become a put-together article.